It is time to assist Baby Hazel with her evening routine! Help with brushing her teeth, bathing, and bed time. The game is won simply by keeping the sweet little girl happy, and completing each step of the routine through three levels until she is peacefully asleep. First, players will brush her teeth and then rinse. Thought bubbles appear above her head with picture hints for the next task. Simple cursor movements help to promote thorough teeth brushing. Bath for Baby Hazel is swift, using soap and a loofah to scrub her well. Clues are given to signal once each step is over. Toweling off and carefully applying lotion encourages good hygiene practice. The next level requires getting her crib ready for bed time. It shows a highlighted area where each item goes, in turn, as well as thought clouds. Make the bed first, with a blanket and crib bumpers. Then the stuffed animals and rattle go into the crib surrounding the sleeping spot. After the player puts Hazel into the crib, a story book is read by night light. Some parts of the story featuring the wolf might scare her, and soothing by patting and distraction by rattle may be needed. In a very realistic bed time setting, the sleepy girl must have soft music from her music box, dim lighting from the table lamp, and comforting pats and kisses. 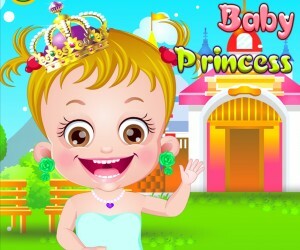 The player must follow her dreams and pat the her when she becomes fearful; sprinkle kisses on her forehead, or restart the music box until the happiness meter is full and she is completely asleep. Baby Hazel Bed Time encourages maintaining a strong level of attention as well as nurturing behavior. If these are absent, or mistakes are made in each task, she could become upset and cry thus lowering the happiness bar and losing time to complete the level. Good indicators of happiness, in addition to the bar, are her giggles, cooing, and smile. It is Baby Hazel’s bed time routine!!! 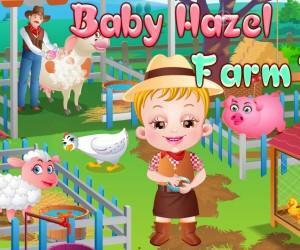 Here you get a chance to help Baby Hazel in her bedtime activities. First thing before sleeping is hygiene care. Brush her teeth and give her a shower. Then you need to make a bed for her. Finally tell her favorite story till she goes to sleep. Baby Hazel may wake up in the middle of her sleep. Be with her and soothe her with lullabies, loving touches and kisses.